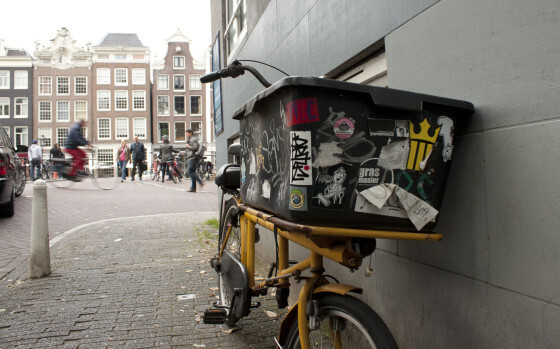 Bike theft in Amsterdam is a major problem with estimates running at more than 50,000 bicycles stolen annually in the city. Therefore, it is important to take precautions and lock your bike properly. 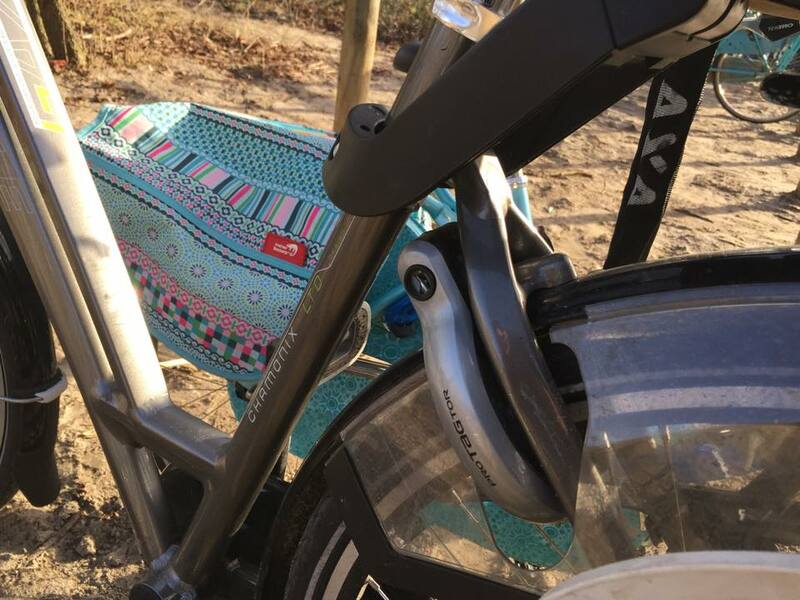 The wheel lock is attached to the bicycle’s frame and it works by positioning a metal rod between the spokes on the back wheel so the wheel cannot turn. Generally, a key is connected to the lock and when you push a latch down, then turn and pull the key out of the mechanism, the back wheel becomes locked. You will need to look after this key to unlock the wheel lock when you return to your bike. The key stays inside the lock as you ride your bike, which helps remind you to use this lock when you leave your bike. A fairly standard bike lock, the chain is used to wrap around the wheels, the frame, and the stationary object you are locking your bike to. The ends of the chain have different connections, some have a combination lock, some require a key. It is important to attach the lock to something stationary and wrap this chain around the wheels as thieves will steal parts of a bike, especially when it’s easy because it’s not locked. Before leaving the bike rental shop, make sure you have tested and know how each of the locks works. Some of the wheel locks and the connectors on the chains can be finicky and it’s much easier to ask one of the bike shop employees who are familiar with the particular locks. Purchase bike insurance if you’re renting. Generally there is an option of getting insurance by paying extra Euros but the amount is often fairly low. It’s worth it to not have to worry about having to replace a bike for several hundred Euros! Park in well lit areas. Thieves operate everywhere but parking your bicycle at designated bike lockups near busier areas rather than down an alley where nobody walks usually lowers the likelihood that your bike will be stolen. Lock your bike to a stationary, secure object. There are many bike racks around Amsterdam to lock your bike to but it can sometimes be difficult to find an empty space. Make sure you lock your bike to some sort of object that is secure and won’t move or break easily. Do not leave your bike unattended and unlocked for even a minute. Even if you have just stopped to take a photo and are within 20-meters of your bike, lock it up. Avoid using the “best” or most fancy looking bike. You are stuck with what you get when renting but the point is not to draw too much attention to your bicycle. You might notice that some residents of Amsterdam have awful looking bikes that are painted in bright solid colours, or personalized in a strange, creative way. This is a security feature to make the bike appear less appealing to steal. 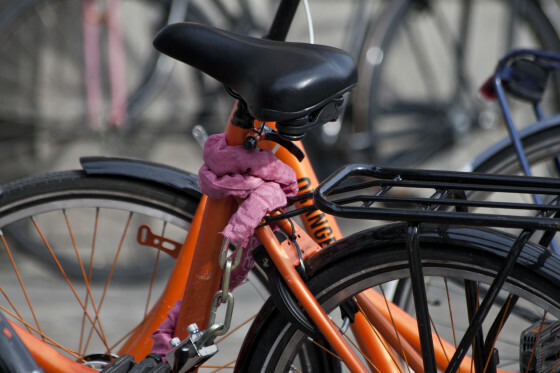 Taking these precautions will help prevent your bicycle from being stolen and ensure you enjoy your time cycling around Amsterdam.